Fill out the application(s), send in your money, and get your group together. WHEN CAN OUR KREWE START THROWING TO THE CROWD? Your Krewe CAN NOT throw items prior to the barricades. If you do this it will entice the spectators to filter into the line up area without barricade protection and could cause harm to someone. DO NOT throw prior to your float turning onto Garden Street. Parade applications are due by February 6th, 2015. What is considered a unit? A unit consists of 1 vehicle pulling 1 trailer and/or no more than 20 walkers. What if I don't know who the driver of the vehicle will be on parade day? If you are unsure of the driver and have a couple of driver’s that could drive the vehicle, please have those drivers fill out and sign the vehicle application. Send in those applications along with a clear copy of their driver’s license and make a note. Please note that on Parade day if the information that you have provided us does not correspond with the driver that is driving the vehicle, we can and will pull you out of the parade and you will not receive a refund. What type of insurance is required to participate in the parade? Vehicle insurance is required. No execptions. If you are using a personal vehicle, then a copy of your vehicle insurance is required. If you are using a tow truck company, then a copy of their insurance is required with Pensacola Mardi Gras, Inc. and the City of Pensacola as additional insurers. Who do I contact if I want to purchase a float? Mr. Roy Welch with Quality Specialty Products will sell you a trailer, you can contact him at 850-469-0902 or visit him at 100 Massachusetts Avenue, Pensacola, Florida 32505.
Who do I contact for a float rental? Over the years, Mr. Kip Dingler has been offering float rentals. For more information please contact him at 478-477-3280 or 478-256-8944 or check out his website at www.kipdingler.com. Are there any size requirements for the floats? The Florida Department of Transportation has a requirement for vehicles on the City streets. Should the float be wider than 8 feet, you will need a special permit from the FDOT to operate on the State roadway system. Also the height should not be greater than 13 feet, so as not to interfere with traffic signals. What types of items can be thrown? The City of Pensacola has an ordinance regarding the items that can be thrown to the crowd. The item must weigh 2 oz. or less. For more information go to www.ci.pensacola.fl.us and click Ordinance. The Ordinance number for the throws is 19-90 1, 3-22-90. What happens if it is raining the day of the parade? The Parade will go on. There will be no refund given if you or Krewe decides not to join on Parade day. There are various levels of sponsorships. Just contact Pensacola Mardi Gras by telephone 850-436-7638 or email pensacolamardigras@gmail.com and we will be more than happy to send you information. Can I have my event listed on your website? Yes. Anyone and everyone is welcome to have their event posted on our website. Just email us at executivedirector@pensacolamardigras.com with the event information. Where do I go to purchase Pensacola Mardi Gras merchandise? T-shirts are always available Parade day! If you can’t wait, then please just call the office 850-436-7638 and we will make arrangements to get them to you sooner! We can always use a few good volunteers! Contact us here. Are pets allowed in the parade? NO. Unfortunately, our insurance does not cover animals of any sort on the parade route. 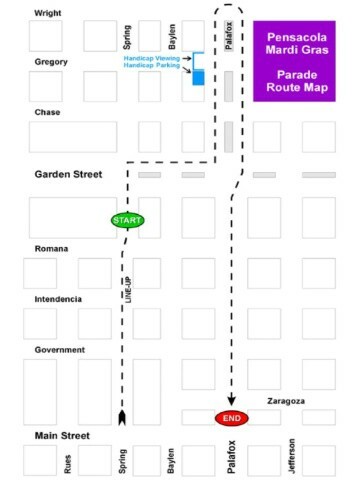 You can view the parade map here. Where is the handicap parking lot and handicap viewing? On the Southwest corner of Chase and Palafox. You can view the map here. Do I have to pay for parking to view the parade? Parking is free. There are some business along the parade route that will allow community groups like the Boy Scouts, Girls Scouts and Schools to charge a fee for people to park in their lot. 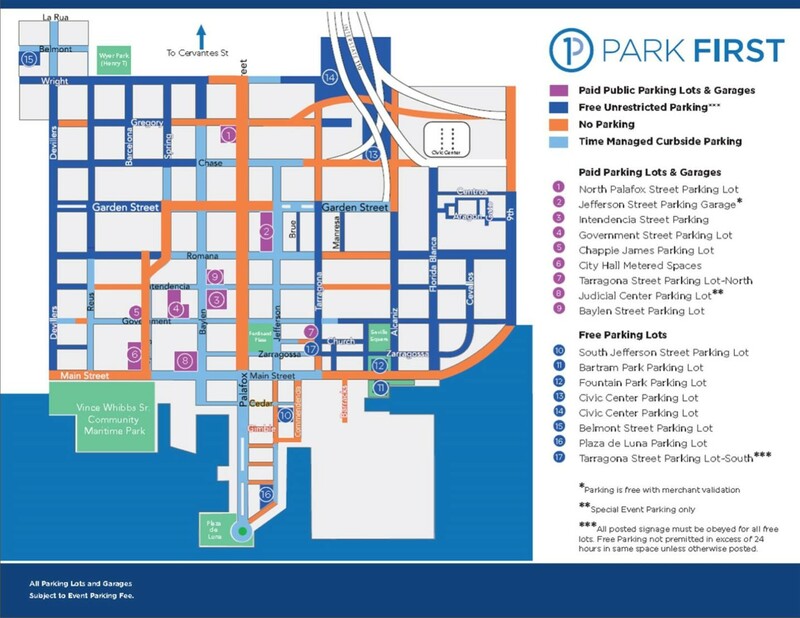 Click Here for the complete DIB parking map.